A mid Cambrian scene, a reconstruction of the famous Burgess Shale site in what is now British Columbia, Canada. In the foreground a swimming Laggania cambria has captured a hapless trilobite. On the sea floor from left to centre respectively are a solitary specimen of the proto-annelid Wiwaxia and three specimens of the lobopod Hallucigenia. Note in both animals the defensive array of spines. Further to the right is the lobopod Aysheaia with its anterior prongs around the mouth, as well as the protoarthropod Opabina, a close relative of Laggania. Descending to the sea floor are two individuals of the basal arachnomorph Marrella. Also visible in this scene are sessile epifauna in the form of the deuterostome Dinomischus (yellow) and the hexactinellid sponge Vauxia (blue). Image and (modified) caption from here. Image originally from The Crucible of Creation by Prof. Simon Conway Morris. The first eon of Earth’s history, from the first coalesence of the planet, about 4500 Mya, to about 542 Mya, is referred to as the Precambrian. From this hint, one might well suppose that the Cambrian comes next -- which it does, in a way. Actually, this is the biggest break point in all of geology. It marks the beginning of the Phanerozoic Eon, the Paleozoic Era, the Cambrian Period, the Terreneuvian Epoch, and the Fortunian Age (the first age of the Cambrian). The Cambrian Period was named in 1835 by the geologist Adam Sedgwick, after the region of Cambria in North Wales, where rocks of this age were first found. The name "Cambria" is a version of Cumbria, a latinisation the Welsh Cymry (= countryman, compatriot against the invading Anglo-Saxons). Long before it was a formal stratigraphic unit, the Cambrian was a concept about Earth history. It was understood to be the earliest period in which one could find the fossils of multi-celled animals (Metazoa). Since then, metazoans and their fossilized traces have been found well before 550 Mya. In particular, Ediacarans, a group of very strange and poorly understood creatures -- but obviously metazoans -- have been found in many parts of the world with ages pushing the 600 Mya mark. Consequently, paleontologists now view the Cambrian as the period when the Bilateria first appeared and, almost at the same time, the first metazoans with shells. The Bilateria include all living metazoans except jellyfish, corals, and sponges. Bilaterians have a head at one end of an elongate body which is bilaterally symmetrical (hence the name). Their embryos all develop a separate layer of embryonic cells, called mesoderm, between the gut or coelom and the outer wall of the animal. If this whole description suggests a worm, you’ve got the right idea. A flatworm is the most basal living form of bilaterian. Unlike many other, somewhat arbitrary, geological markers, the base of the Cambrian Period is defined with reference to the underlying paleontological concept. Small worms rarely leave body fossils, but their burrows are frequently preserved. The burrows of bilaterian worms are fairly distinctive. Trace fossils are often given names as if they were organisms, and the earliest well-known bilaterian trace fossil is a type of fossilized burrow referred to as Treptichnus pedum. The base of the Cambrian is currently defined as the first occurrence of T. pedum at Fortune Head, near the town of Fortune, on the north coast of western Newfoundland, Canada. The Cambrian period saw most continents located in the southern hemisphere at low paleolatitudes (near the equator). The Ediacaran supercontinent of Pannotia continued to assemble in some regions but fragmented into Gondwana Laurentia, Baltica, and various mostly submerged Asian blocks. Laurentia stretched across the Cambrian equator, partly submerged by the Iapetus ocean, with a mostly mostly submerged Baltica and Siberia approaching from the South-East. Gondwana remained the largest supercontinent. Other continents included Kazakhstania and China (actually China, Thailand, Malaysia, and Indochina). Seas were for the most part shallow, especially along the edges of the continents. Global (eustatic) transgressions occured in the Middle and Late Cambrian, as shallow seas repeatedly invaded the land, providing a perfect habitat for many types of marine invertebrates. These shallow epeiric seas covered much of the continents except for Gondwana, where there were highlands. Other highlands could be found in Eastern Siberia and Central Kazakhistan. The stratigraphy of the Cambrian -- particularly the Early and Middle Cambrian -- has always been chaotic. A brief survey of recent work suggests that it is likely to remain that way. The ICS has outlined its proposal for these epochs, but it has been impossible to obtain concensus. The heart of the problem lies, not with some innate intractability of the stratigraphic psyche, nor with administrative bungling by the ICS. The source of the confusion is, rather, the creativity of stratigraphic science. 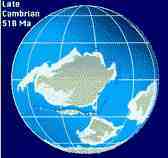 In the XIXth and XXth Centuries, the Lower Cambrian could not be subdivided with any confidence because none of the usual markers were present. There were few well-mapped Early Cambrian sites, and no Early Cambrian conodonts, ammonites, graptolites, readable magnetic polarity reversals, or even thankfully!) any iridium anomalies. Nevertheless, the problem in the XXIst Century is the opposite. We are now awash in data from new sources using new methods which have not been adquately standardized, correlated in different regions, or securely nailed down with radiometric dates. One excellent example is the base of the Cambrian itself. Only a few years ago, the stratigraphic community coalesced around the idea that, although there were essentially no Earliest Cambrian fossils, except the unclassifiable Ediacaran fauna, the Cambrian should begin with the first macroscopic trace fossils -- simple bioturbation by bilaterian "worms." In 1992, the ICS selected a suitable global stratotype section and point in Newfoundland, Canada, to mark the first clear appearance of bilaterian animals at about 542 Mya. Now (2006), only 14 years later, it is obvious that the Bilateria date well into the Ediacaran, as evidenced by fossils like Kimberella (Fedonkin & Waggoner, 1997), bilaterian, possibly arthropod, trace fossils (Martin et al., 2000), and -- yes -- even trace fossils of bilaterian worms (Dornbos et al., 2005). Meanwhile, new, but rather unstandardized, stable isotope techniques (e.g. 87Sr/86Sr, δ13C) have added layers of new stratigraphic information. See, generally, Knoll 2000) (we, too, have had a shot at explaining δ13C measurements and discussing some of their problems). Previously "enigmatic" Ediacaran and Early Cambrian fossils are also being gradually tied to conventional taxa, so that biostratigraphic schemes and correlations can be extended into previously dark corners of the Cambrian. Knoll (2000). For examples, see Jago et al. 2002); Gubanov & Peel (2003). Finally, as in many other areas of paleontology, political changes in the last two decades have opened new localities to exploration (and closed others). Consequently it has become possible to create rather elaborate biostratigraphic correlation charts, such as the one shown here, adapted from Gubanov & Peel (2003). Click on the chart to see a larger, almost legible, version. As in many such studies, Gubanov & Peel have used the Russian (Siberian Platform) stage names for the Early Cambrian ages. However -- and also as in most such studies -- the absolute dates developed by Gubanov & Peel for these presumptive Early Cambrian stages bear little resemblance to the ICS scheme. 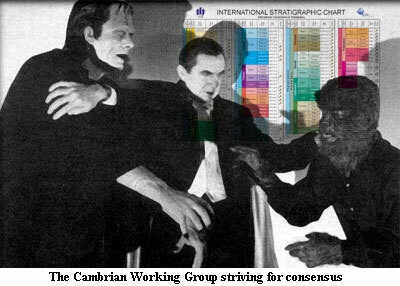 Meanwhile, the International Subcommission of Cambrian Stratigraphy (ISCS) at the ICS has been, ever so slowly, working away at the insurmountable problem of imposing an "official" stratigraphy on ground which is both literally and figuratively shifting. On one side, they face increasing pressure and high-volume whining from ill-mannered people, including ourselves, who need a stable, well-characterized outline for the Cambrian. On the other side lies the abyssal certainty that, whatever they decide, it will be obsolete within a few years and everyone will laugh at them. So, like Frankenstein (who was sort of a committee himself) the ISCS has slowly retreated before an angry mob of geological peasants armed with with torches and pitchforks, shuffling up the narrow mountain defile towards an inevitable doom. Occasionally, the ISCS howls with rage and frustration, and tosses down a partial decision or two to discourage the more aggressive challengers. In this curious manner have we made halting, and somewhat limited, progress toward an official stratigraphy of the Cambrian. Actually, a comparison of the annual reports of the ISCS for 2001 and 2005 suggests that not a lot has been accomplished in the last few years, and the ISCS website is in serious disrepair. Nevertheless, the promises made by the Subcommission have at least become much more specific, due largely to actions taken in the last year (2005). Here's the current status. The Early Cambrian will be divided into two epochs ("series"), each containing two ages "stages"). The earlier of the two epochs is the Terreneuvian. The general effect is to collapse the top of the Early Cambrian into the Botomian (!). The Middle Cambrian and Furongian will each have three ages. The impact of tripartite divisions is hard to assess, since almost every regional system uses only two stages for each of these epochs. The ISCS has picked out some likely trilobites to mark these later stages. Thus, we expect that all this will be filled out with trilobite zonation in the fullness of time. Cambrian Furongian Cambrian X Dolgellian ~492? 4? 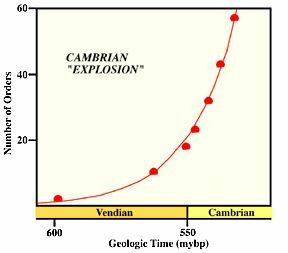 Cambrian V Early Amgan ~510? ~3? Cambrian Epoch 2 Cambrian IV Botomian (including Toyonian) ~517? ~7? Cambrian III Atdabanian ~521? ~4? Terreneuvian Cambrian II Tommotian ~528? ~7? The '~' indicates an estimated date or duration, while '?' indicates unofficial status of the underlying stage. The Cambrian climate was generally warm, wet and mild. As there were no continental landmasses located at the poles, ocean currents were able to circulate freely, hence there was no significant ice formation. As a result temperatures worldwide were mild. The Cambrian constituted a benign spell between two great ice ages - the late Proterozoic Snowball Earth and the Late Ordovician Ice Age. At the beginning of the Cambrian period, about 540 million years ago, life was entirely confined to the oceans. During the 53 million years that the Cambrian period lasted there was the sudden appearance and diversification of almost every major group (phylum) of animal life, as well as many types that later died out. Animals with shells and exoskeletons appeared for the first time, including trilobites, brachiopods, molluscs, and many other groups. This sudden evolutionary burst was so spectacular that it has been termed the "Cambrian explosion". There hasn't been anything like it on Earth before or since. The most characteristic animals of the Cambrian period were the trilobites, a primitive form of arthropod remarkable for it's highly developed eyes (unusual in such an early organism). The trilobites appear suddenly during the Atdabanian epoch (several groups are known, including large spiny types and small planktonic forms), reached their fullest development in the middle Cambrian and the following (Ordovician) period, and gradually declined after that and became extinct by the end of the Paleozoic era. Other very important groups of Cambrian animals were the sponges, echinoderms (represented by a large number of different classes), and most interesting of all the soft-bodied echiurians, which were burrowing worm-like creatures (see right), which seemed to have been the most important and predominant carnivores of the time. The earliest gastropods (marine snails) also appeared in this period, as did the cephalopods (during the Furongian) and other now extinct lineages of Molluscs. Molluscs however were still relatively rare, they did not become an important element of the marine fauna until the Early Ordovician period. The first chordates (vertebrate ancestors) occurred as did the first foraminifers (shelled amoebas). Many Cambrian creatures however did not fit into modern categories of organisms; they seemed to have been representatives of unknown or experimental phyla. 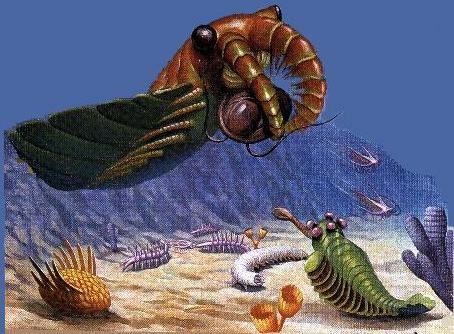 Greatest of all the Cambrian beasties were as the Anomalocarids. Shown here is Laggania cambria. Averaging 45 to 60 cm, with exceptional specimens reaching 1 or even 2 metres, these animals dwarfed even the largest trilobites. They were armed with twin grasping organs and a wicked mouth with a ring of teeth in shape rather like a pineapple slice. Many trilobite exoskeletons have been found with large bites taken out of them, the result of an encounter with Anomalocaris. Like the shark of today, Anomalocaris . was perfectly adapted to its environment, and a single species existed without change for some 30 million years or more. Scientists do not agree what group of modern creatures Anomalocaris was most closely related too. Suggestions most often include arthropods, but the aschelminthe group of worm-like creatures is another possibility. I am wary of pigeonholing extinct organisms with living types on the basis of superficial similarity. Like many Cambrian creatures, Anomalocaris is best put in a phylum of its own. Halkeria is one of a number of the strange armoured "coat of mail" creatures that inhabited the early Cambrian oceans. The specimen shown here is about 3.5 cm in length. In addition to the calcareous scales it possessed two mollusc-like limpet-shaped shells. Later forms such as the Middle Cambrian Wiwaxia lost the shells and developed long spines instead. It is not certain that these strange creatures even are molluscs, although a radula-like structure has been found in Wiwaxia. Jan Bergström suggests that they represent a group of late surviving "Procoelomates", the ancestors of all higher (Coelomate body plan) animals. The enigmatic sponge-like cup-shaped archaeocyaths left) were very common during the early Cambrian, forming great reefs, but died out almost completely by the middle of the period, leaving no descendents. Plants of the Cambrian period included only algae (seaweeds). There were no known land plants, the land was still bare of any life other than microorganisms. The Latest Botomian (Toyonian) fauna represented a more traditional trilobite-brachiopod dominated Cambrian ecosystems. But even here there were a number of extinction events that took a toll on the marine fauna, During the Furongian alone, there were three distinct bio-stratigraphic intervals in trilobite distribution, each marked by a mass-extinction. The cause of this is not clear, but it may have been related to climate change, as most genera affected were warm water species. Following the earliest Cambrian (Tommotian) fauna, there was a rise of herbivore grazers (e.g. gastropods), and consequent decline of algal stromatolites . There were almost no large animals, and only a few predators (chiefly anomalocaridids). Cyanophyte algae mats encouraged mat scratchers (diverse ancestral mollusks, esp. diverse monoplacophorans and polyplacophorans), and some probable mat-sticking echinoderms helioplacoids). The Cambrian saw the beginning of bioturbators, with limited vertical mining abilities. This infauna was generally shallow, burrowing close to the sediment-water interface with the exception of vertical Skolithos burrows, which were often deep. Trilobites dominated the mobile benthos, accounting for over 50% of Cambrian hard-shelled species. In many exposures, over 90% of the fossils recovered are trilobites. Benchley & Harper (1998). However, note that, the fact that trilobites are the most common fossil doesn't necessarily mean that trilobites were the most common animal. Trilobites had a hard carapace, molted frequently, and hence they left a disproportionately heavy fossil record compared to other creatures living at the same time. These trilobites were mostly benthic epifaunal detritovores (possessing a backwards facing mouth). That is, they were detritus-feeders crawling across or swimming above the sea-floor. Other species may have lived in shallow burrows. Both body and trace fossil representatives of the trilobites are common in Cambrian strata. They are known from many growth stages, thousands of species, and trace fossils. The functional morphology of the Furongian olenids indicates the already sophisticated design of the Cambrian Trilobita. Cambrian communities were loosely organized and considerable experimentation and morphological flexibility were features of many troops (Hughes, 1994). Cambrian Lagerstätten such as the Burgess Shale contain a wide range of apparently morphologically disparate organisms." Brachiopods included "inarticulates"; both linguates (infaunal forms with calcium phosphate shells) and craniids epifaunal forms with calcite shells). Articulate brachiopods (epifaunal with calcite shells) are present but rare.